Did you know that Donald Trump is teensy tiny? He’s wittle. 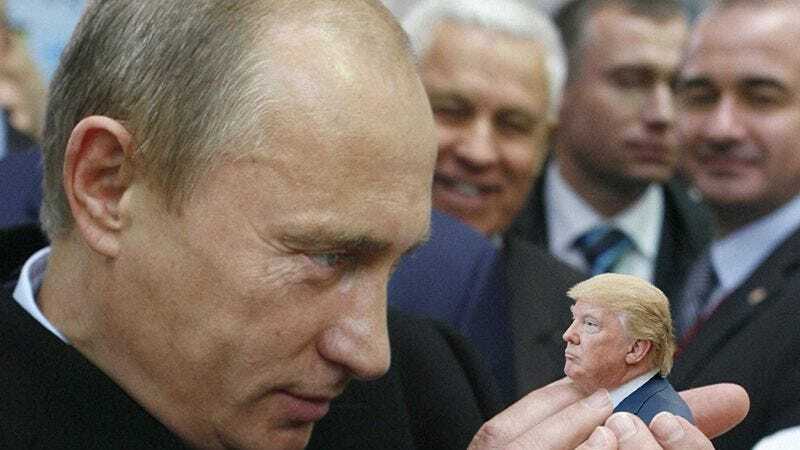 It’s hard to see as much on all the FAKE NEWS sources that depict him as a normal-sized human, but just last week some enterprising Reddit users were able to unearth undoctored images that show Trump for the elfin button that he truly is. Some questioned the images’ validity, so Evil Ice Cream Pictures took it upon themselves to provide video evidence. In the minute-long video, we see “Pocket POTUS” signing discriminatory executive orders, envying the size of his grandchildren, and standing atop a stack of hardcover books during a press conference with Canadian Prime Minister Justin Trudeau. There’s more on the way, too. Evil Ice Cream just commented on the video to say another Tiny Trump video is on the way, and should arrive by this weekend. Don’t be too charmed by his diminutive stature, however. Napoleon was tiny, too.